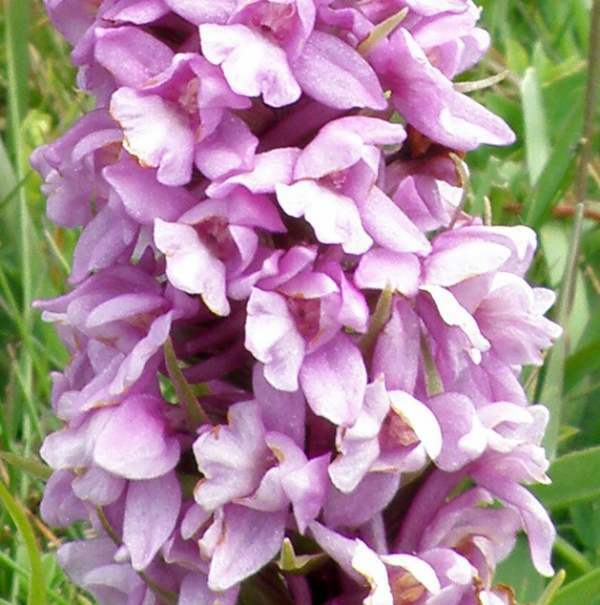 The Fragrant-orchids have been the subject of much molecular study in recent years, and as a result of differences revealed between them, the three British-growing varieties of Gymnadenia conopsea referred to as Gymnadenia conopsea (Chalk Fragrant-orchid), Gymnadenia borealis (Heath Fragrant-orchid) and Gymnadenia densiflora (Marsh Fragrant-orchid) may eventually be accepted as three distinct species. The third of these types, Marsh Fragrant-orchid, grows in alkaline marshy ground and is therefore more easily distinguishable by habitat if not by obvious morphological differences. The remaining types, Chalk Fragrant-orchid and Heath Fragrant-orchid are more difficult to tell apart. 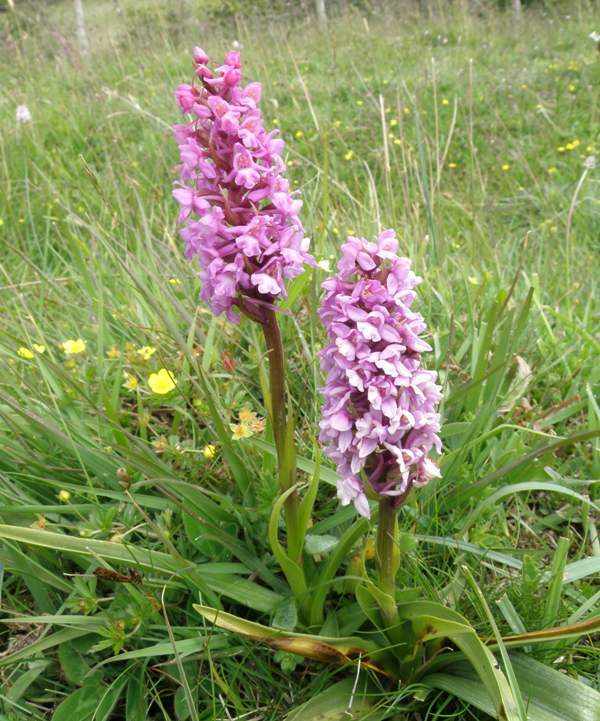 The Marsh Fragrant-orchid can grow up to 70cm in height and has several deeply keeled, pointed leaves around the base of the plant. There are narrower bracts higher up the stem. The densely-packed flower spike, which gives this orchid its common name, carries up to 100 flowers which vary in colour from light to dark pink. The lips of the flowers have three distinctly rounded lobes. The specimens shown above were photographed at Cors Bodeilio National Nature Reserve inthe Anglesey Fens, North Wales in mid- June. 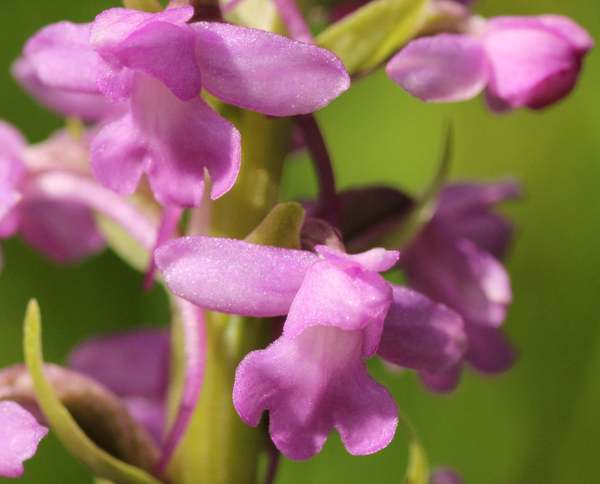 The range of this plant is very hard to determine because the three fragrant-orchids that grow in Britain are so frequently confused with each other. In other parts of the world the picture is even more confused because there is an additional plant called Gymnadenia odoratissima which is accorded species status to add to the equation. In Britain The Anglesey Fens National Nature Reserves in North Wales are a good place to see this orchid because they provide a rare habitat that suits it - marshy ground that is not so acid that they cannot survive. The reason for this special environment is that the fens are surrounded by limestone rocks which filter the water running into the marsh raising the alkaline levels of the substrate. Gymnadenia conopsea var. densiflora is found in marshy ground as described above for the Anglesey Fens. Occasionally it is also found on chalk grassland and in sand dune slacks.